If you live in the RDU area, then you already know that our summers are two things: hot and humid! Even luxury apartments in Durham, NC can’t escape the heat. Despite the sizzling temps that come with summer in the southeast, you still want your outdoor space to look beautiful and inviting. 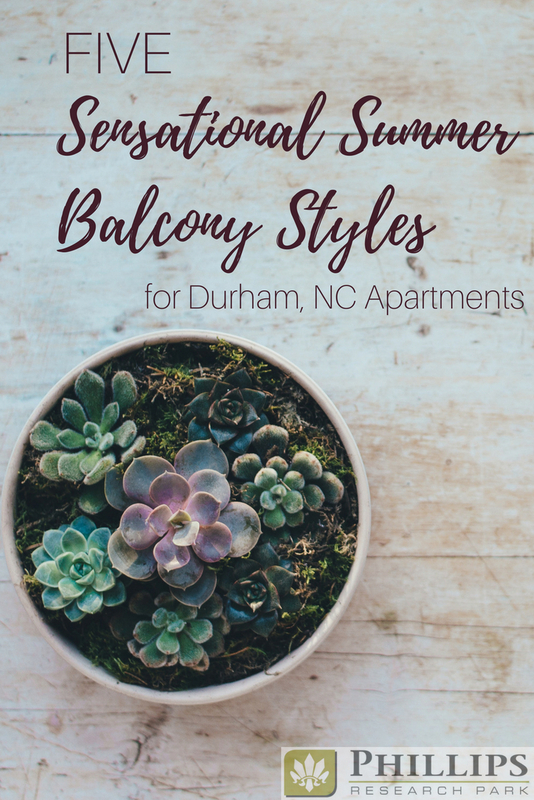 Keep reading to discover five sensational summer balcony styles that are perfect for Durham, NC apartments! Did you know that the beautiful beaches of coastal North Carolina are only a 3-hour drive from apartments in Durham? This makes places like Emerald Isle, Atlantic Beach, Topsail Island, and Wrightsville Beach perfect places for a beach getaway. If you love the coast, but can’t get there quite as often as you would like, then it is time to bring a little bit of the beach to you. It’s time to GO COASTAL! A coastal inspired balcony is a great way to enjoy the cool aqua and blue hues of the beach, any day of the week. Start your beachy balcony project by picking outdoor cushions and throw pillows with shades of turquoise, light blue, and navy blue. Then, add a pop of color with bright coral or red. Any style patio furniture will work for your coastal theme. White wicker or black metal would both be nice. Your beach balcony will start to come together nicely once you add several coastal accents like shells, a lantern, or even a few plants. A planter with ornamental grass is a great way to bring the feel of the dunes to your Durham, NC apartment. Southwest design elements are all the rage, no matter what the season. 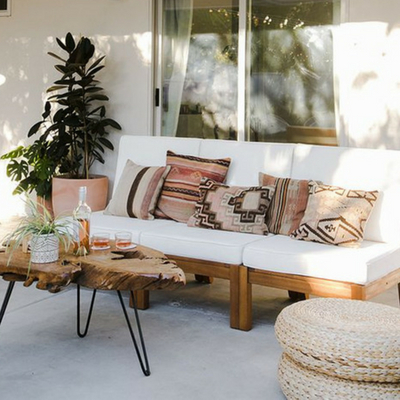 It is easy to bring this classic yet hip vibe to your patio with a few simple furniture pieces and color palettes. For a simple southwest theme that is modern and up-to-date, you are going to want to balance classic black and white hues with basic earth tones. A few metal pieces, like your furniture or candle holders, will pair nicely with natural wood pieces. When it comes to fabric, you can’t go wrong with a vintage Aztec pattern or cow print. And if you are not familiar with Mudcloth, now is the time for a proper introduction. This block print normally features lines and dots, stamped in a pattern on natural woven fabric. There are great reproduction options that are weather resistant. If you are looking for a few plants that will compliment your southwest design, then consider something like an Agave. This heat tolerate plant will do great outdoors during the summer, and it can be moved indoors during colder months. Terra cotta pots are also a great way to bring in an earthy southwest feel. If you like succulents, then this balcony style may be for you! Apartments in Durham don’t have to be void of cottage charm. If you love a space that is soft, cool, and inviting, then a cute cottage theme is right for you. This is the perfect place to sip a tall glass of iced tea or curl up with a good book. This design is quintessential southern front porch… but on your balcony. Pick colors that are soft and feminine. Light yellow, lavender, sage green, and pink are all great choices for your cottage color palette. Pick a few fabrics with subtle stipes or floral patterns. Something quilted would also work well. For your furniture choices, white wicker or white painted wood is the way to go. Beautiful baskets filled with flowers will pair perfectly with your cottage theme. Sweet alyssum mixed with colorful Petunias is a great combo for your planters. If cottage décor isn’t your thing, then maybe you should give your balcony a modern twist. As with most modern design, clean lines and geometric shapes are a must. 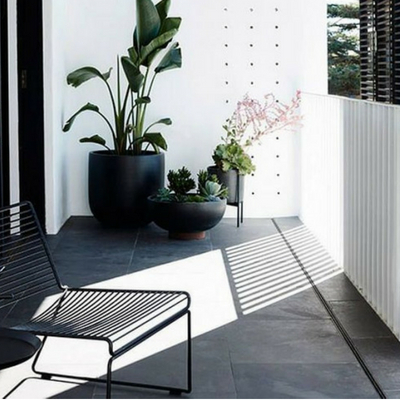 Black metal furniture with straight lines will be a sleek addition to your patio area. As far as colors and fabrics, any color will do. From neutrals to bold and bright, the sky is the limit. Black, white, gray, and bright yellow are a great combination. Variegated Liriope, also known as monkey grass, is a fantastic way to bring in more straight lines and a bit of color. To take your modern balcony over the top, pick one “wow” item to feature. A large ceramic bowl or a piece of metal art would be a great conversation piece and wow factor. Do you love bright and bold colors? Do you want your balcony to be a constant party with fun and funky design? Well, break out the flamingoes and the pineapples… and any other fun décor items! Your balcony is about to come alive. Begin by picking a color palette that works for you. Bright green, pink, yellow, and blue look great together. Combine prints, florals, stripes, and solids for a picture perfect patio. An outdoor area rug is another great way to add color. Next, string a few fairy lights, and your look is complete. Lantana, a hardy and heat resistant plant, with bright yellow flowers, is a fantastic idea for patio planters or pots. There you have it! 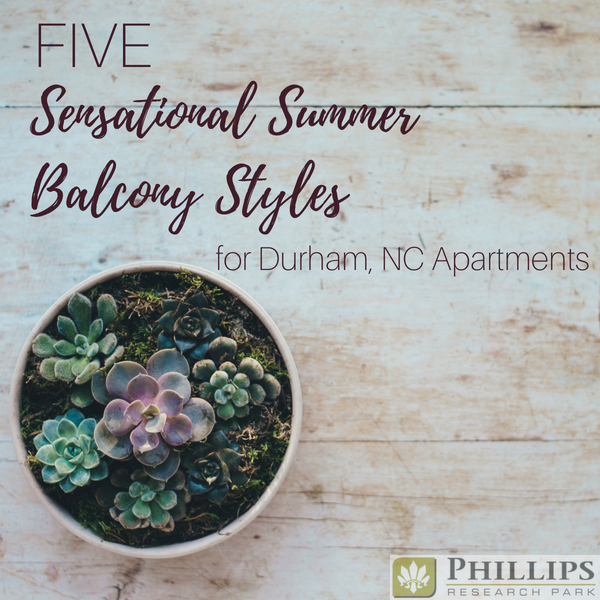 Five sensational summer balcony ideas that will work for apartments near RTP or anywhere in the Triangle. No matter how you decide to decorate your patio, be sure to use it… and enjoy the soothing sounds of summer. A cup of coffee in the morning or a glass of wine in the evening is the perfect way to regularly utilize your apartment balcony. If you are looking for a new apartment, be sure to visit us today for a tour. We offer 1 bedroom, 2 bedroom, and 3 bedroom apartments with amazing amenities!